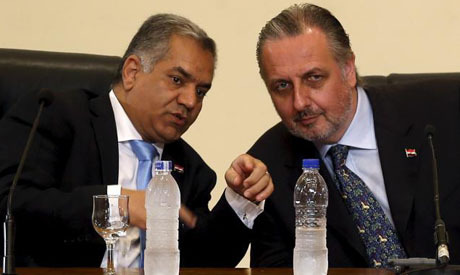 British Egyptologist Nicholas Reeves (R) listens to Antiquities Minister Mamdouh Eldamaty during a news conference in Cairo, Egypt, October 1, 2015. During the press conference held Thursday at the State Information Authority in Heliopolis, archaeologist Nicholas Reeves announced that the gold funerary mask belonging to the boy king was originally made for his stepmother Nefertiti. Reeves, who believes that Nefertiti’s final resting place hides behind Tutankhamun’s burial chamber, cited this as a piece of evidence proving his theory. Reeves explained to Ahram Online that the gold mask was remounted years ago at the museum, allowing him to examine the back. He then realised that the face was made independently of the opposite side. “I thought that it was very strange and may just be a technical feature.” However, he also noticed that the type of gold used for the face is different than that used on the back of the mask as well as the inlays. The eyes are in lapis while other blue portions of the mask are made from glass. “It is very unusual,” Reeves said, adding that he then started to look at other features of the mask. With more studies, Reeves learned that ancient Egyptian kings never wore earrings. “There is no image of any ancient Egyptian king wearing earrings,” he asserted, adding that Tutankhamun did not have pierced ears but a depression that shows he wore earrings only as a child. “But the funerary mask has holes to hang earrings,” he pointed out. “Looking at the mask again I can see that the inscription on the cartouch has been changed, meaning that all these treasures found in Tutankhamun’s tomb were originally made for Nefertiti as a co-regent to her husband king Akhenaten, and not for Tutankhamun as previously thought. “I believe that Nefertiti never used these treasured items since she obviously had a better collection because, according to other evidence, she became a king,” Reeves pointed out. He continued, saying that 80 per cent of Tutankhamun’s collection was made for Nefertiti, especially the canopic jars. For now, we have to wait until the end of November to confirm the existence of a hidden chamber. At that time, radar and thermal imaging will be used to scan the tomb, differentiating between bedrock and artificial walls. “Even if he finds a hidden passageway, that doesn't mean that digging will begin immediately,” Minister of Antiquities Mamdouh Eldamaty said. Eldamaty said that before starting any work to reveal such a tomb, we must find a way to protect the tomb of Tutankhamun. “Does that mean we will dig from above, below or from the side? We don't know yet," he explained. Despite the note of caution in his voice, Eldamaty appears to be as excited as Reeves at the prospect of solving this ancient mystery. “When we find Nefertiti, I think it will be more important than the discovery of King Tutankhamun himself," Eldamaty told Ahram Online. He added that he hopes the hidden chamber belongs to Nefertiti, but he doubts it does. Eldamaty added that King Tutankhamun had many women in his life, and if a new tomb is discovered, it could easily belong to one of them. “It could belong to one of his sisters, or his mother Kiya, or Merit-Atun, the wife of King Smenkare, whose mummy was unearthed in tomb number KV55, located in front of Tutankhamun’s tomb. Let us wait for the end results,” Eldamaty told Ahram Online. 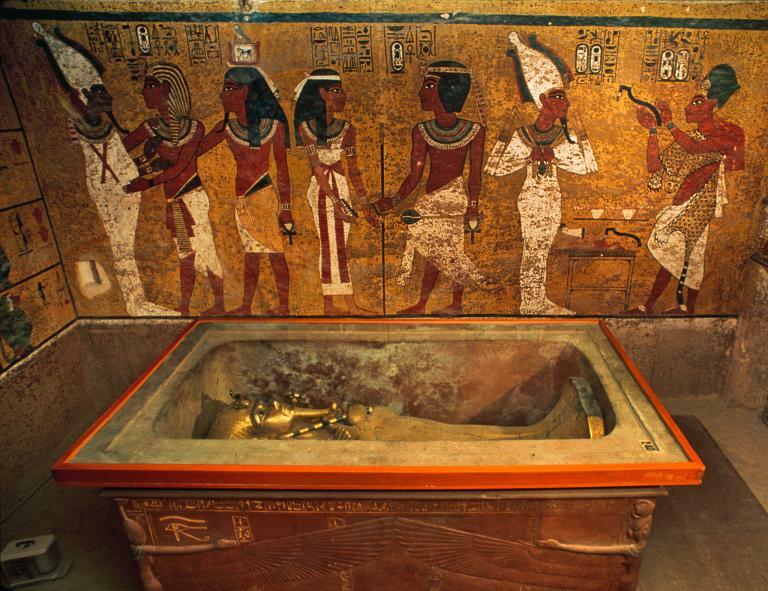 I am riveted by Reeves' theory of Nefertiti's hidden tomb within Tutankhamun's tomb. It would explain a great many things. I do take umbrage, however, with his claim that “There is no image of any ancient Egyptian king wearing earrings..." There are, in fact, more than several sculptures of Akhenaten - Tut's presumed father - WITH pierced ear lobes. Later sculptures of Amenhotep III (Akhenaten's father) also indicate pierced ears. It seems to have been an advent/Pre-Amarna through Amarna artistic innovation. A cursory Google image search of Akhenaten and Amenhotep III clearly reveals this portion of Reeves' assertion as questionable. However, the fact that gold foil covered the earlobes of the infamous mask has long presented a quandary. Counter to the Reeves hypothesis, it is also possible that the deliberate act of masking the hole piercing could have been an attempt by the Amun priests - restored to their Pre-Amarna power during Tut's reign - to reverse unorthodox conventions. This is the most exciting news since 1922. I am beside myself with excitement. To think we may be this close to finding Nefertiti is beyond thrilling. Will be waiting with bated breath for this event! What great timing as well! Howard Carter's discovery made the world fall in love with Egypt, hopefully it will happen again. Egypt needs it desperately.